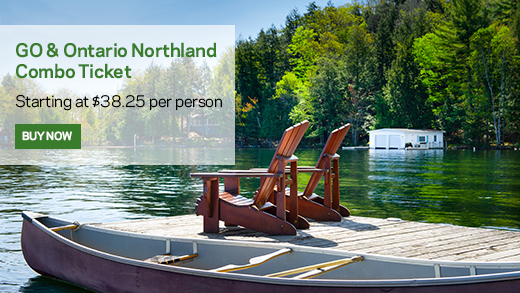 We’ve partnered with Ontario Northland to make it easy to get to cottage country this summer. Whether you’re meeting up with family or friends, we’ve got you covered. Every Friday in August, an Ontario Northland bus will connect with the 5:35 p.m. GO Train from Union Station at Allandale Waterfront GO Station to take you to Gravenhurst, Bracebridge, Huntsville and North Bay in the Muskoka region. Return service will be provided on Sundays/Holiday Mondays in the Muskoka region starting in North Bay, picking up in Huntsville, Bracebridge and Gravenhurst before meeting the 9:11 p.m. Toronto-bound GO Train at Aurora GO Station. One ticket will provide you with transportation on both the GO train and the Ontario Northland bus. Tickets can be purchased in advance at ontarionorthland.ca or at each Ontario Northland bus stop. Instead of tapping a PRESTO card on the GO train, you can simply show your ticket when requested. Best of all, kids 12 and under ride free on both Ontario Northland buses and the Barrie GO Train line.